It seems only fitting that we’d squeeze one more game of awesomeness from this year’s Stanley Cup Finals. •The epic first installment of Ovechkin vs. Crosby/Malkin, a seven-game cliffhanger that saw all but two games decided by one goal. • The coming-out party for Blackhawks prodigies Jonathan Toews and Patrick Kane during Chicago’s run to the Western Conference Finals. • The memorable aforementioned second round, with three of the four series going the seven-game distance. • San Jose making yet another way-too-early playoff exit, likely their most spectacular flameout in team history, as the President’s Trophy winners bowed in six games in the opening round. • And, of course, the hockey marvel that is the Detroit Red Wings, who just find ways to keep winning, no matter what. I am by no means a Red Wings fan, inclined to dislike all the old Norris Division rivals of the Minnesota North Stars team I grew up rooting for. Those old prejudices have faded considerably over time (It still irks me that Gary Bettman and the NHL placed the Wild in a division with such obvious geographic foes in Calgary, Edmonton, Vancouver and Colorado … makes total sense, right?). At this point in my life I find myself simply appreciating teams and players for what they are, or at least I try to, and what the Red Wings are is the best team in North American professional sports, period. The Red Wings have only three players on their roster who were first-round draft picks, and only one that they selected themselves (Dan Cleary, No. 13 overall in 1997). The other two, Brad Stuart and Marian Hossa, were drafted by other teams and acquired through trades. The other three teams that advanced to the conference finals had several more first-rounders on their rosters: Carolina had nine, Pittsburgh has eight and Chicago had seven. Pavel Datsyuk and Nicklas Lidstrom are arguably two of the 10 most valuable hockey players to their team as there are in the NHL, and neither of them has played a healthy game in this series. Datsyuk has been outstanding the past two games, with two assists and a plus-2 mark in a 5-0 Game 5 shutout at home, and made some spectacular plays to set up scoring chances in both. But the Wings had to do without him in the first four games of the series, as well as the final three games with Chicago in the Western Conference Finals. Lidstrom, on the other hand, has found a way to stay on the ice, missing only two games with his “lower-body injury” in the series with Chicago. The six-time Norris Trophy winner has two assists and is plus-3 in this series, but he’s looked pretty wobbly, and while defensively he’s been pretty solid, offensively he isn’t as spry as he usually would be. Despite that, the Wings have hardly missed a beat. They have proven themselves to be the deepest team in hockey, that’s for sure, and even with a banged-up Datsyuk and Lidstrom, Detroit is the consensus favorite on their home ice tonight for Game 7, and for good reason. Justin Abdelkader dressed in place of Datsyuk early in the series, and all he did was score a goal each in Games 1 and 2 — the first two goals of his NHL career. Darren Helm has been a revelation in these playoffs, scoring four goals and playing solid at both ends of the ice in all situations, including one of the greatest penalty-killing shifts I’ve ever seen in the Game 5 clincher against Chicago before eventually notching the winning score in overtime. Dan Cleary has stepped up with nine goals (three game-winners), and is fourth on the squad with 15 points. Valtteri Filppula is third on the team with 16 points in the playoffs (three goals, 13 helpers), and Lidstrom’s countryman, bruising defenseman Niklas Kronwall, has helped pick up the slack on the back line. As the cliché goes, you throw out all the stats for a Game 7. So with that in mind, I’m picking the Penguins to win tonight, despite an avalanche of numbers that don’t support their candidacy. The key is Marc-Andre Fleury, who was absolutely brilliant in Game 6, not so much in Game 5 and several other contests this spring. 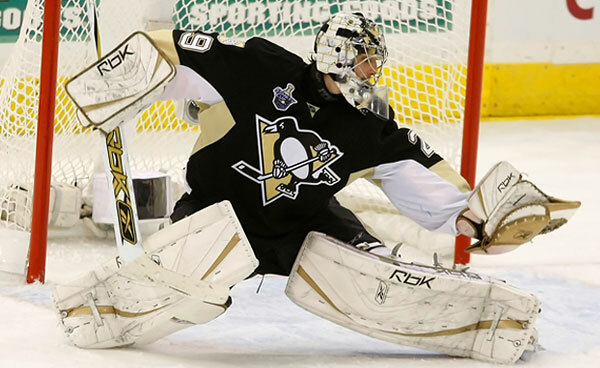 As I said a few weeks ago, I don’t fully trust Fleury, and he was awful in getting pulled from Game 5 last Saturday. Some people wondered if he’d be haunted by that performance in Game 6, but he wasn’t. To his credit he’s been at his best when the Penguins were in their most dire straits in these playoffs, and in 2008. The signature game of his career so far was his 55-save performance in Game 5 in Detroit last year, when he was the main reason the Pens were able to force a sixth game. He wasn’t able to reproduce that effort in Game 6, and actually knocked Henrik Zetterberg’s eventual game-winning goal into his own net, sitting on top of a relatively innocuous rebound in the crease after losing sight of it. In the second round this season, Pittsburgh beat Washington 6-2 in an anticlimactic Game 7 on the road, but a nearly forgotten moment in that game came early when Fleury denied Alex Ovechkin on a stone-cold breakaway when the game was scoreless, flashing his glove hand and doing the full splits to rob the world’s most dangerous goal scorer. Sometimes a lot is made of a team scoring the first goal, but I think the key for the Penguins will be if Fleury is sharp early and can make that first big save, because you have to think the Wings will come out flying, energized by what I’m sure will be an insane Joe Louis Arena crowd. The thing with Fleury is he’s either feast or famine. He’s a former No. 1 overall pick — the first goaltender ever to be selected with the top pick — so the talent has always been there. If I were drafting an NHL team today, there’d be a lot of goaltenders I’d take before “The Flower.” But when he’s good, he’s really good, it’s just that he’s not always good. It’s simple: If Fleury can tame the bouncy “Flubber Boards” at The Joe (and you’d think he’d have adjusted by now, after three games this year and three last year), and is on his game, I think the Pens steal the first road win of this series and skate with the Cup. If he goes MIA again, they’ll be partying in the Motor City tonight. • If the Penguins win tonight, Evgeni Malkin will be an easy choice as the Conn Smythe Trophy winner. He leads all players with 21 assists and 35 points, and trails only Sidney Crosby, by just one goal, for the top spot with 14. He’s got seven power-play scores and three game-winners. If Detroit holds serve and wins their fifth Cup in 13 seasons, I think Chris Osgood wins his first Conn Smythe to go with his fourth Stanley Cup ring — third as a Wings starter. Mitch Albom of the Detroit Free Press thinks this is a huge game for Osgood beyond the obvious reason, and as I said a few weeks back, I agree. “[I]t’s not a stretch to think that a victory tonight, with a good performance by Osgood, secures him: 1) a fourth Stanley Cup, 2) a Conn Smythe Trophy as the most valuable player in the playoffs, 3) a historic footnote as the goalie who stymied Sidney Crosby and Evgeni Malkin, and 4) the Hockey Hall of Fame. Now lets take a closer look at some of those “meaningless” stats and facts that will have little or no impact on tonight’s game. • The Red Wings are 11-1 at Joe Louis Arena this postseason, and it took the Anaheim Ducks three overtimes to pin that renegade loss on them in Game 2 of the second round. • Road teams playing in Game 7 of the Stanley Cup Finals, NBA Finals and World Series have not fared well in recent years, and in fact it has been 30 years since a road team won a Game 7 in a final series. It was, however, a Pittsburgh team that pulled it off, when the 1979 Pirates beat the Baltimore Orioles. • The Penguins have three players who have participated in a Game 7 of the Stanley Cup Finals before: Craig Adams (Carolina, 2006), Ruslan Fedotenko (Tampa Bay, ’04) and Petr Sykora (Anaheim ’03). Penguins head coach Dan Bylsma also played for the Mighty Ducks when they lost to the Devils in ’03, and the coach of that Ducks team? Current Red Wings skipper Mike Babcock. Brian Rafalski, a Dearborn, Michigan native and already the owner of three Stanley Cup rings, played for that Devils team and also the one that lost the finals in seven games to the Colorado Avalanche in 2001. He is the only Red Wings player to appear in a Game 7 championship tilt.